In July, the McDonald’s corporation released a budget plan for its employees that could be accessed online. This budget plan, the multi-billion dollar employer claimed, was a useful resource for its workers to show that life without a living wage was possible. Candidly named the “Practical Money Skills Budget Journal,” this guide to living clearly suggested that a second job is necessary to make ends meet. With a monthly budget of $2,060 and 70-plus hours on the clock, McDonald’s seemed all too eager to outline that living paycheck-to-paycheck was indeed possible, so long as health insurance, heat, child care, and adequate groceries go unaccounted for. If McDonald’s poor wages and poor treatment of its employees is not a clear insult, a “budget plan” so detached from reality clearly is. 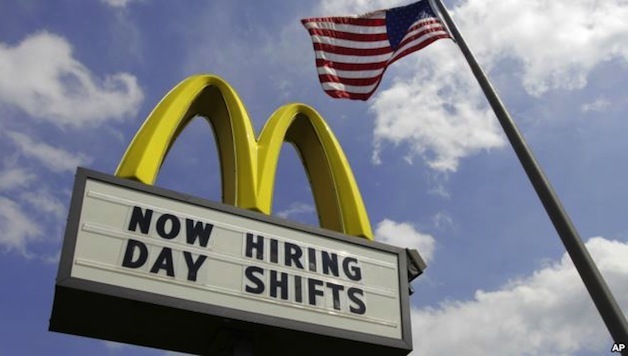 But McDonald’s is not the only corporate power to exploit its workers with low wages and low hours. Poverty levels have continued to rise as wages stagnate, and families are forced onto government assistance programs. The federal minimum wage at $7.25 fails to meet basic living expenses, and it is clear that retail and fast-food industry giants will not shift their pay scales on their own volition. As a former employee at Walmart, I have seen firsthand the tactics used to keep employees from organizing for better wages, hours, and conditions. From day one, new workers are subjected to anti-organization propaganda and kept short-staffed and isolated in their departments. Lower-level managers are placed under immense pressure to discourage employees from registering complaints. Sick and injured workers are threatened with disciplinary measures or slashed hours if productivity is not kept up to par. Entire stores are staffed with part-time employment. This allows the company to skirt benefits while keeping its employees on the verge of complete poverty. These conditions are not just exclusive to Walmart; they are an entire industry standard. With the formation of worker’s rights organizations such as Our Walmart and Fast Food Forward, the latter a campaign focused on fast-food workers, employees are making a stand. Calling for $15 an hour and the right to organize, these movements are allowing workers to fight corporate exploitation and for a living wage that can help communities thrive.